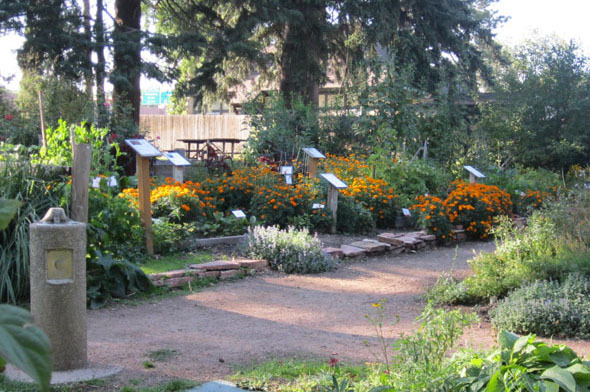 The Demonstration Garden, at the corner of Cache La Poudre Street and Glen Avenue. In addition to shade-loving perennials, there are a vegetable garden, an herb garden and a garden devoted to scented plants. The gardens are always open to the public free of charge. The 50-year-old Demonstration Garden won a first place landscape design award from the All-America Selections, which promotes the use of plants suited to specific climates. A stroll in the gardens reveals another stopping place – the historic Van Briggle Building, which Colorado College has restored and decked out with a small garden complete with art pieces and benches. The Horticultural Art Society was founded in 1962 with the mission of sharing information on the plants that can thrive in the Pikes Peak region. The group offers a series of classes on gardening throughout the year (see online calendar).